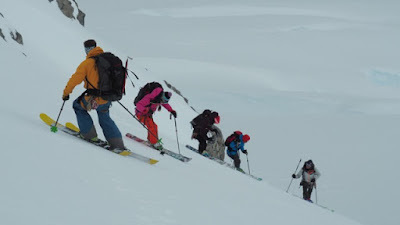 Mammut Avalanche Safety: Polar Ski Guide Todd Offenbacher Returns From The Antarctic Peninsula. Polar Ski Guide Todd Offenbacher Returns From The Antarctic Peninsula. 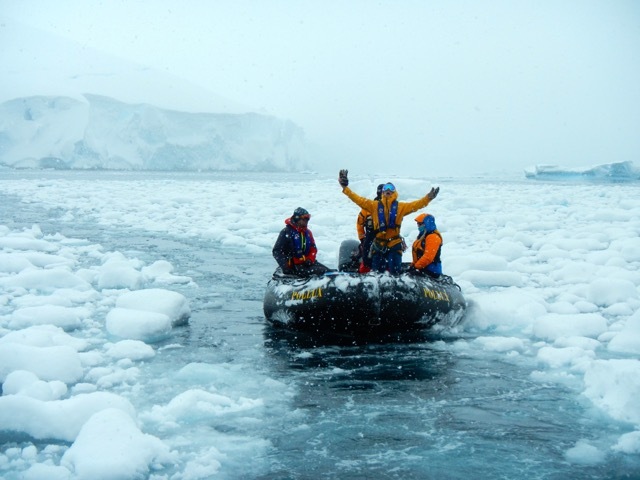 Mammut Ambassador Todd Offenbacher recently returned from his fourth trip to the Antarctic Peninsula--a unique trip that combines extremely remote ski objectives with incredible decadence aboard the 99 meter icebreaker, The Sea Adventurer. No other trip in the world compares to skiing in this polar environment aboard a floating hotel. As a guide this trip offers some very unique challenges and hazards that must be mitigated daily. All the normal risks of skiing in an isolated part of the world are present including avalanches and crevasses. But above and beyond that their are risks of disembarkation in the Antarctic Sea. To access the Peninsula, Zodiacs are lowered into the water from cranes each morning. They are then loaded with skis, backpacks, ice axes, and clients via a gangway. Each boat can hold up to 11 people. Eight clients, 2 guides, and the driver. This is where it gets most interesting. Access to the snow can be very challenging due to the massive glacier wall that guards the land. These glaciers calve on a regular basis and are not safe to climb, or to approach. The ideal landings tend to be flat snow ramps or rocky beach bluffs which can be hard to locate. These too can be subject to hazards like large swells, brash ice that can block exits back to the safety of the ship, and wind that can shut down all operations on and off the water. Zodiacs search for landings in unusually calm conditions. On one early morning recon missions to scout out landings we were hit with several large waves that washed in the boat and over our heads. The weight of the water overflowing in our raft immediately pinned the small craft to the rocks on shore. A proper Antarctic pounding of icy waves followed. This was a frigid eye-opening example of how quickly things can change in this very hostile environment. With the help of a second zodiac we were again free from the rocks. It was a very long and cold trip back to our floating base camp aboard ship. Offenbacher returns from a failed attempt to reach shore. Another unique hazard to guiding this expedition is the number of skiers (with beeping transceivers) in one location at a given time. There are as many as 80 skiers on shore in some locations. Often times groups are skiing down while others are skinning up or using crampons to ascend. Having just completed a training with the Mammut Pulse transceiver it occurred to me the benefits of a transceiver that has the advantage of using digital and analog for more complex multiple burial scenarios. While the maritime snow pack of Antarctica is mostly stable it was comforting to feel well versed and equipped for a worse case scenario. The Pulse transceiver analog capacity can eliminate signal over lap and speed recovery in these complex and often confusing type searches. Offenbacher escorts guests down a steep, firm slope while another group emerges below. As an Ice Axe guide this expedition requires many skills both mountain and maritime. It offers the most amazing setting for skiing in the world, all while in comfort aboard the Sea Adventurer. It is an Antarctic ski safari shared with penguins, seals, and whales daily. 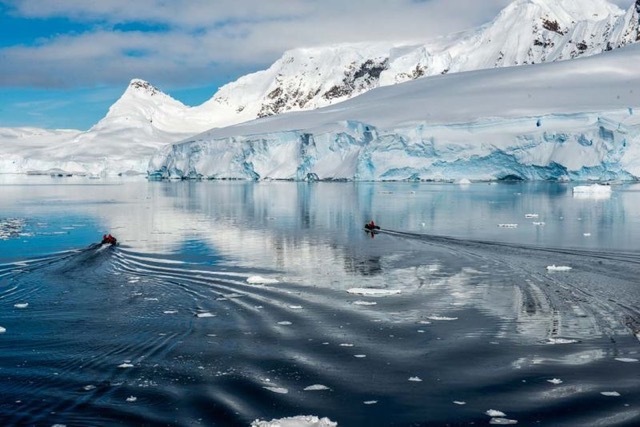 Next year will be the 100-year anniversary of Sir Ernest Shackelton’s amazing journey From Antarctica in the James Cairage to South Georgia Island. How cool would it be to ski with us next year in celebration of one of the greatest adventures in human history?